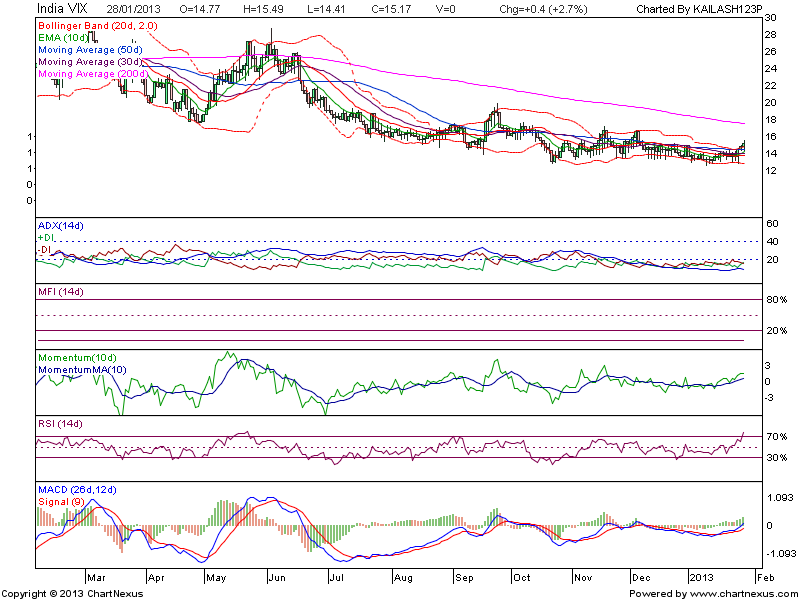 Jan 2013 contracts are going to expire today , it is advised to close them before market close .If you want to continue same position for next month , please roll over under experts supervision. as per option data expect settlement between 6030- 6070...which may change if we notice huge change in options data for real time market updates stay on at yahoo messenger id kailash123p@yahoo.co.in. Get 30% discount on Next subscription renewal on earning highest return in % terms on today's trades at dhanvarsha premium group . 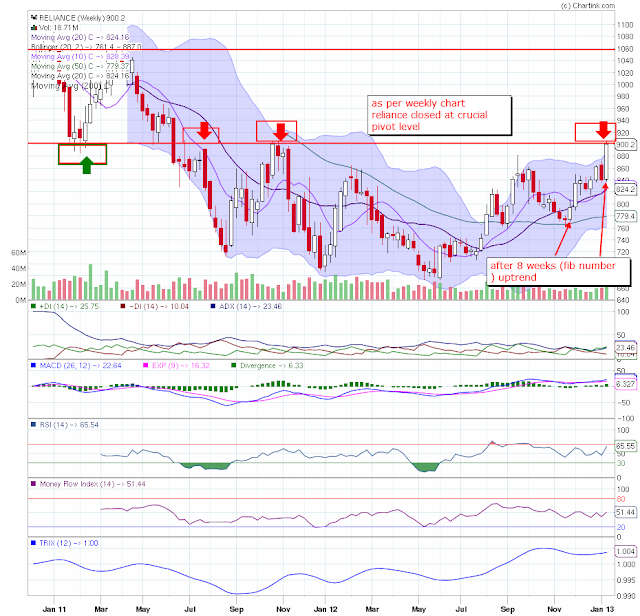 VIX is bullish which is indicating that fear is increased and no doubt if we will see red closing today after policy announcement, so be cautious ..
PooSai (1/29/2013 10:04:46 PM): i am giving giving training to my wife...she dont know how much will affect incase sl not put.. 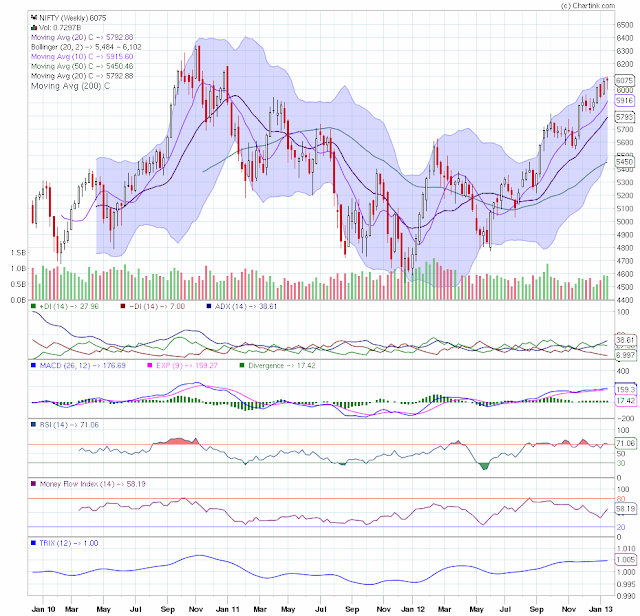 Yesterday Nifty spot closed making Red doji/spindle top near recent high ...volume was comparatively low and today at 11 AM RBI policy announcement will be there ..so expect some fast moves at that time..
Nifty spot 6137 or 5970 ????? 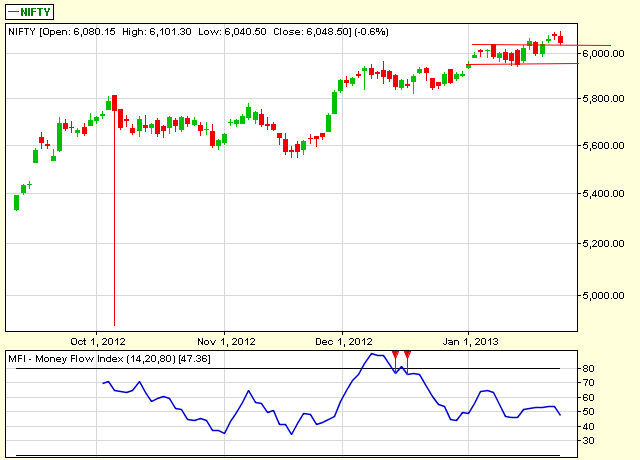 Flat to positive opening is expected with extremely volatile session ahead due to speculation of rate cut by RBI and expiry of Jan contracts ...Stock specific moves may be there ...banking and realty may swing towards higher side...keep watch on IT & FMCG we may see some pressure in them..
Trade according to trend do not carry loosing trade on hopes of reversal ..follow trading rules strictly ..punch stop loss order in system and do not over trade . 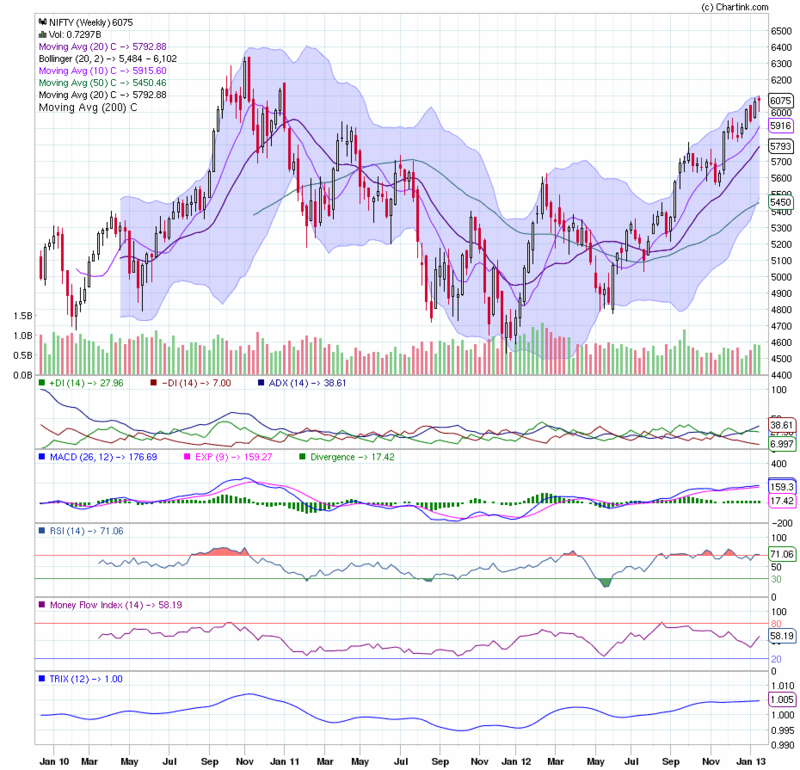 Highest weekly closing after 26 Dec 2010 seen at weekly chart but last candle ended making hanging man near top of bollinger band. 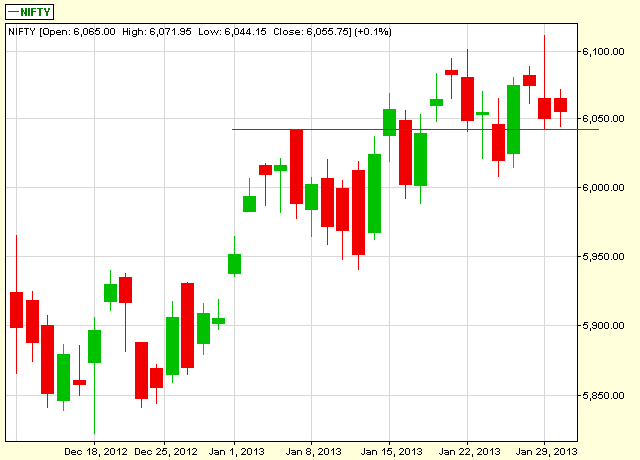 or will try to revert them back towards center bollinger. 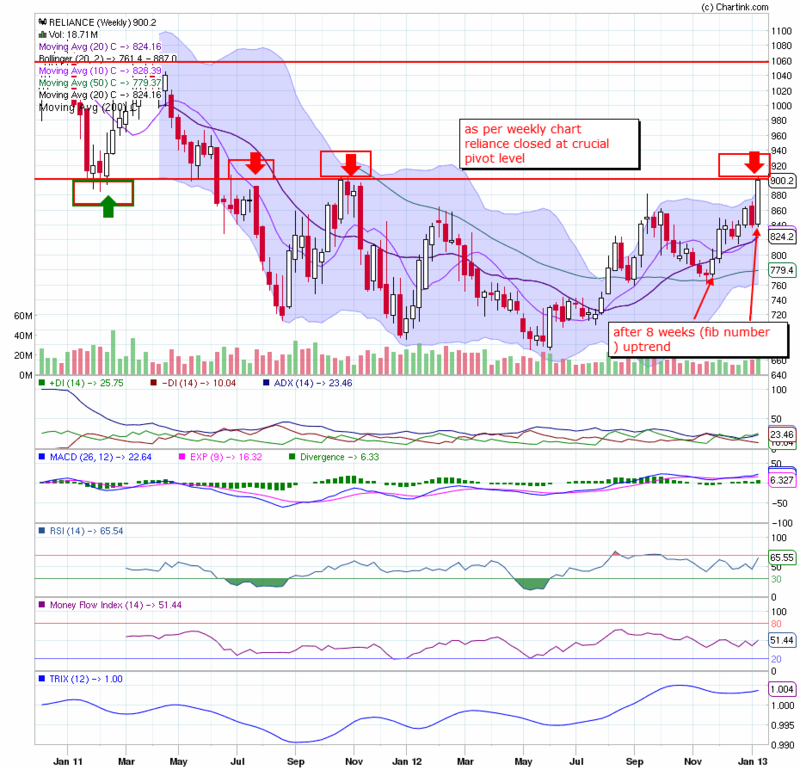 Upside resistances are 6136 6284 and down side supports are 5915 5792 as per weekly chart ..
momentum is gud and trading at bullish note . Next week will be extremely volatile as 2 events- expiry and RBI credit policy will have gr8 impact on market moves ...News and rumors both will be in play so trade cautiously . As per eod last candle it seems that if same momentum will be there then it may cross 6137 and may bang on 6286 provided RBI will announce 0.50 points rate cut . 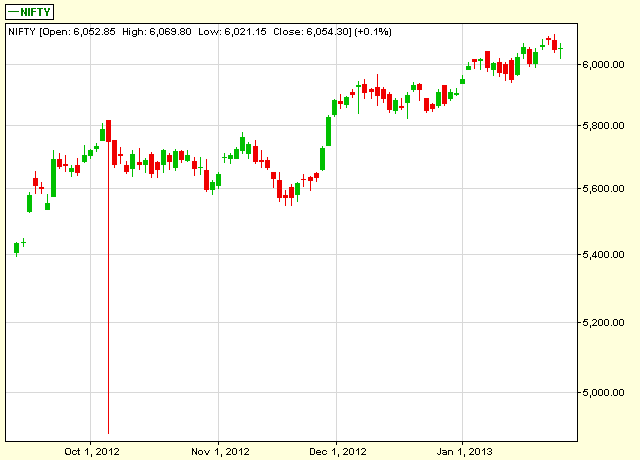 Greg (1/25/2013 9:58:16 AM): future n spot lvls are all almost the same indicating? 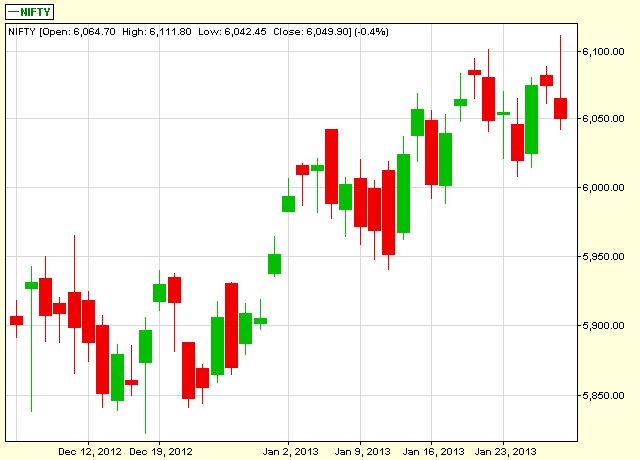 has the nifty trend changed to up? 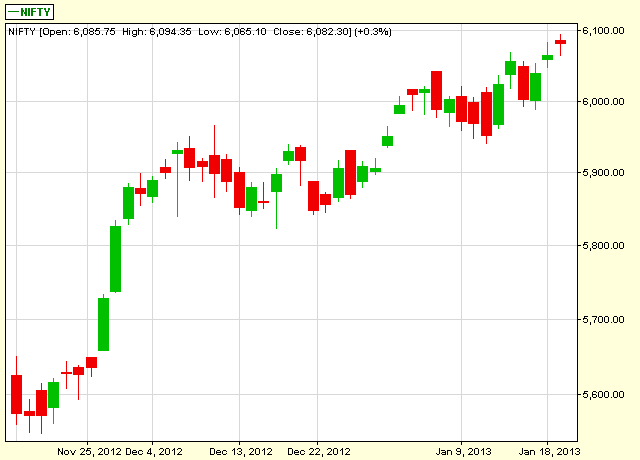 Greg (1/25/2013 2:48:50 PM): has the nifty trend changed to up? 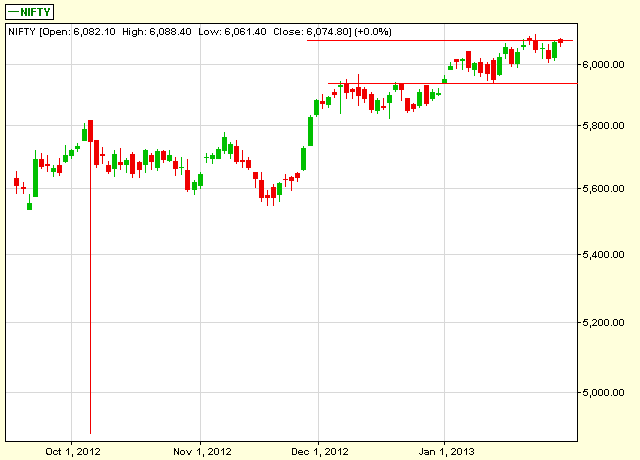 kailash123p@yahoo.co.in (1/25/2013 2:52:18 PM): so fresh shorts were not build up yesterday . 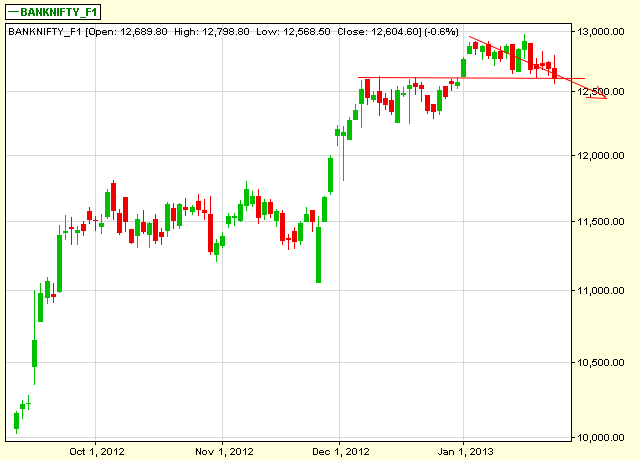 kailash123p@yahoo.co.in (1/25/2013 2:53:10 PM): but it seems that up move is due to short covering which can not sustain. any it is part and parcel of life. and see RCOM tumbled by 8% ...we ad vised to buy pe80 day before yesterday which was moved up by 200 % and traded from 55 ps to 2.50 paisa. 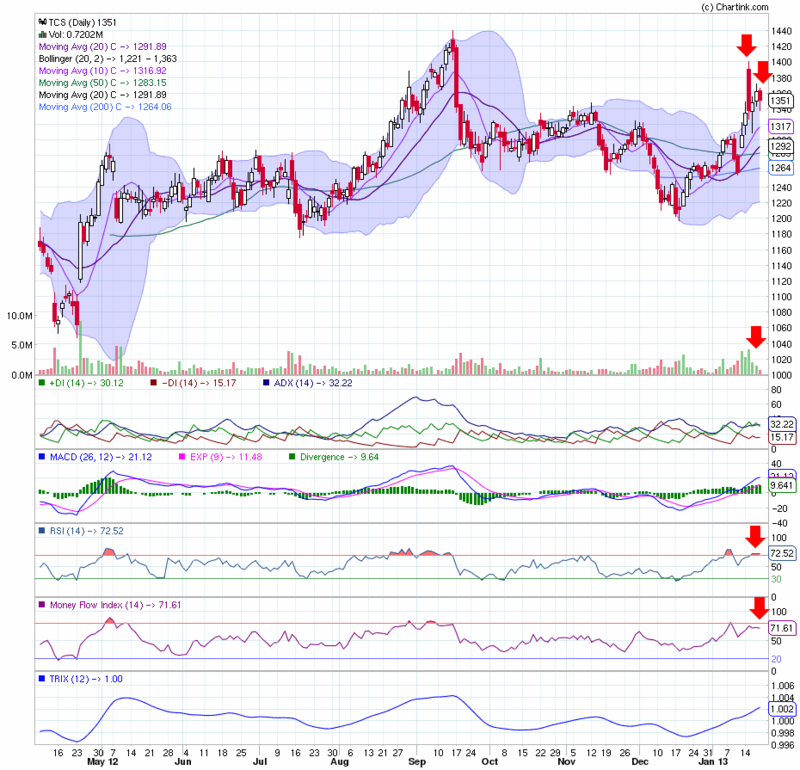 R@HuL: lead is going up? R@HuL: I was reading abt its lot size actually..
Nifty closed making hammer/hanging man /long legged doji at eod chart at channel top..
kailash123p@yahoo.co.in (1/23/2013 2:24:49 PM): rcom pe is gaining 1000 rs r u in trade ? 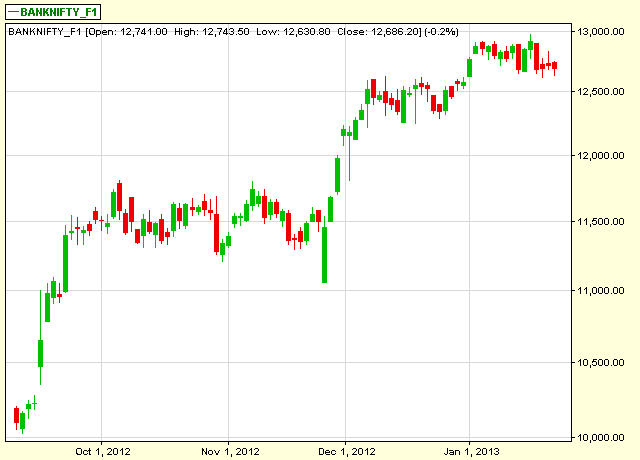 yesterday advised to sell bank nifty at 12770 hope you enjoyed ..
why we were quite confident for nifty fall ? 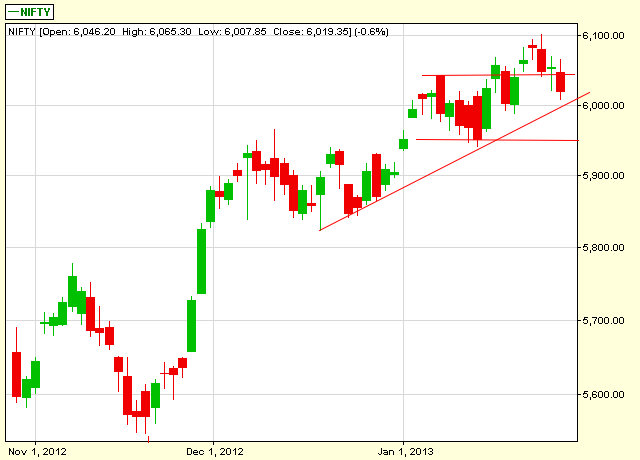 if profit booking will continue in reliance we may see it soon below 900 lvl. 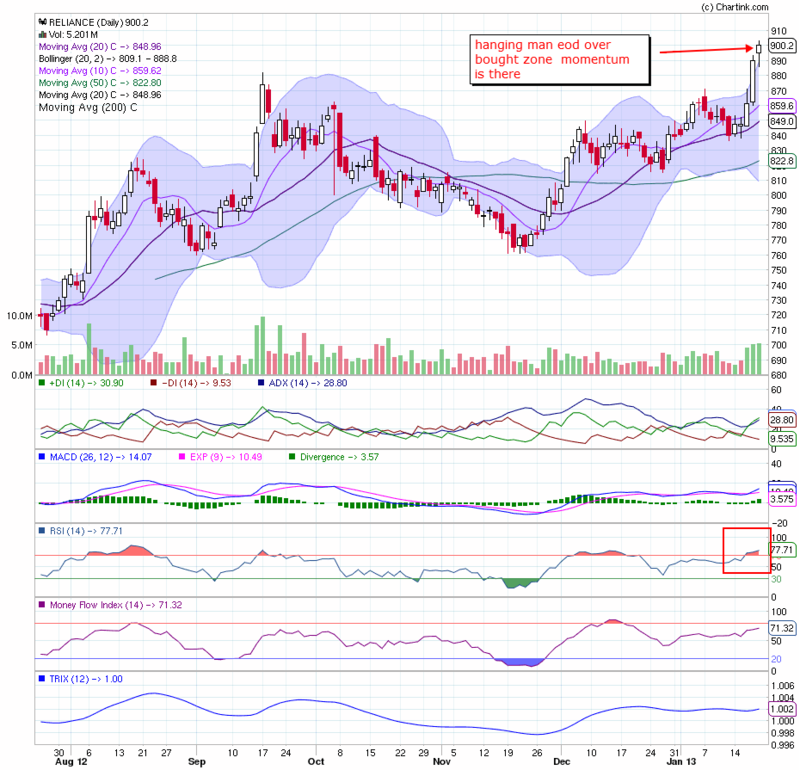 Negative opening is expected with immediate profit booking later we may see buying at lower levels .We have observed profit booking in reliance at higher levels, it could not sustain above 950 and came down to 920 , huge short covering was there so we are expecting more and more selling in it ..advised to go short at 930 940 levels keeping positional sl of 956 and target below 900. Bank of America-Merrill Lynch (BofA-ML) today said the recent partial diesel price hike will inflict a 1.20 per cent burden on the already sticky inflation and that the price index will remain elevated throughout the next fiscal. 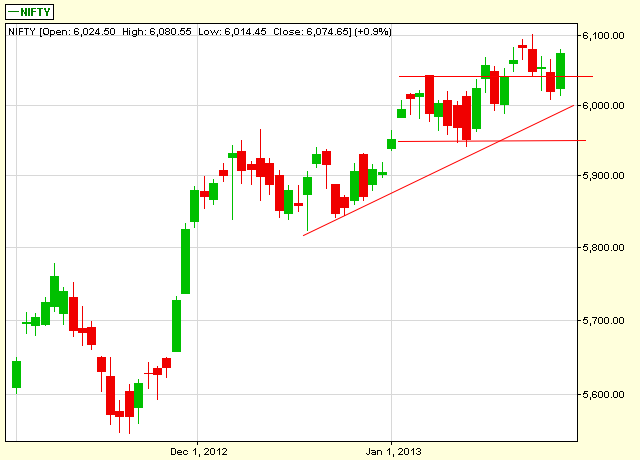 Gap up opening is expected with volatility ahead but the question is will spot nifty continue to trade above 6040 or reenter in its horizontal channel below 6040 .as per Friday's intra day trend possibility of back home is there provided short covering won't take place above 6090 of futures trading .as Nifty premium is not too much means futures traders are cautious . If Nifty futures fail to sustain above 6092 start selling below 6090 with a stop loss of 6109 for targets 6072 6054 ..
Trade according to trend and with proper stop loss punched in system . 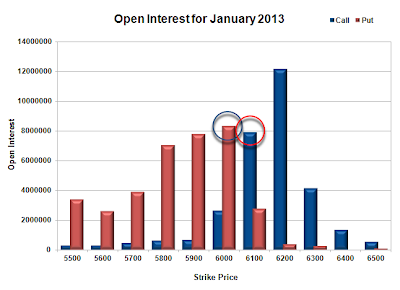 kunal (1/20/2013 2:25:00 PM): ok and Puts! 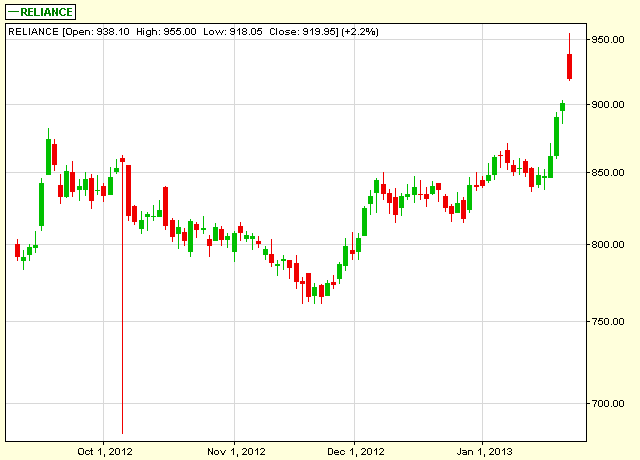 trade after spotting its trend in correct manner ..
later said " corrected due to muted guidance..."
Software-to-soap conglomerate Wipro Ltd’s net profit rose 18 per cent for the third quarter this fiscal, beating street expectations, but gave a muted guidance for the next quarter for its IT services business sending its stocks hurtling to a four-year low. Wipro stocks tanked nearly 8 per cent to close at Rs 397.15, the lowest since January 2009, shaving off Rs 8,364 crore in market value.